Experience the very first electric bike tour in New York City! This tour packs in a ton of views of Central Park and the West Side with less pedaling. E-bikes are the hot new trend in cycling; experience what all the hype is about while sightseeing in NYC. Ride into Central Park, where your guide will give you the dish on notable residents who live along Central Park West and 5th Avenue! Inside the park you’ll peruse all the main attractions on one of our new E-Bikes —we’re talking the Bethesda Fountain, the Met, Strawberry Fields, Belvedere Castle, and more! Next you will Cross New York City’s famed Upper West Side and ride your pedal assist bike to the Hudson River Greenway. 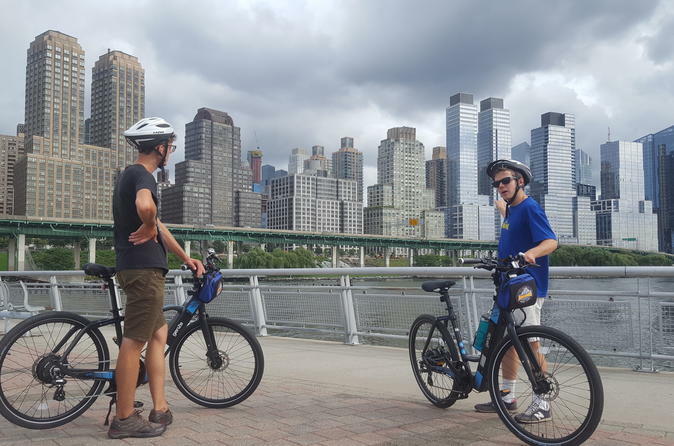 Take in the beauty of the Hudson River and Manhattan’s skyline as you bike along the Waterfront Greenway (which, did we mention, is traffic-free?). Then you’ll ride back to the Upper West Side where you will unfortunately have to return your E-Bike. It’s Electric! This e-bike tour is suitable for those 16 years and older and all levels of fitness. Special Offer - Book by November 4, 2018 to save 10% off our previously offered price! - Book Now!